Vegans clashed with shop workers as they staged a furious protest targeting leather and clothing stores. Members of the group Direct Action Everywhere stormed around Brighton at the weekend in their latest demonstration, holding aloft banners and chanting into megaphones. But police officers had to be called to one shop after the protesters refused to leave when asked by the owners. The group filmed their demonstration across Brighton on Saturday, with footage showing them outside shops including Artemis, a 'bohemian' store which sells sheepskin goods. 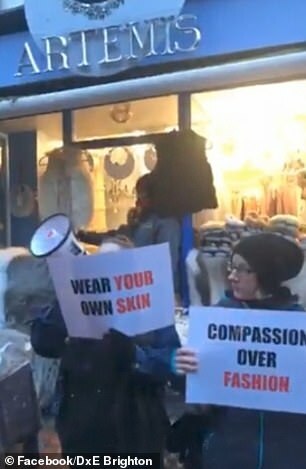 They stormed the city chanting slogans including 'wear you own skin,' and 'compassion over fashion' in a bid to 'disrupt speciesism'. But they clashed with one shop owner after they refused to leave when asked. This comes just days after the group stormed HISBE sustainable food shop in Brighton, East Sussex, warning shoppers not to be 'gullible'. The store says it works with farms where animals are treated with care and respect, only selling locally sourced and free range produce. Its name stands for 'How It Should Be'. But protesters stormed the shop with megaphones to brand the business 'unethical', which owner Ruth Anslow said was 'completely false'. The demos have met with mixed reaction on social media. But while some supporters praised the group and their cause, others remained sceptical and blasted them for their actions. Last month 18 DxE activists targeted the seaside town's Waitrose, holding plates covered in blood and held placards saying: 'Humane murder is a lie' in the supermarket's Brighton store where they told shoppers: 'You can't shop in peace when you're buying death'. They also raided the Touro steak house in Brighton to play animal slaughter noises to diners. Former member Morgan Kayleigh Giampaolo is the daughter of American businessman David Giampaolo, who runs Pi Capital and is Chairman of Gousto, where customers can buy steak, sausage and lamb. Morgan was among those who stormed the Touro steakhouse, playing the sounds of animals being slaughtered to shocked diners in early December. She has now cut ties with the group.